Earning a public administration degree online prepares you for a variety of jobs in public service, many of which come with strong job prospects and competitive salaries. For example, the Bureau of Labor Statistics projects employment for social and community service managers to grow 18% by 2026, significantly faster than the national average for all occupations. The median salary for these roles exceeded $64,000 in 2017. An online public administration bachelor's degree also provides a foundation for continuing your education at the graduate level, expanding opportunities in urban planning, civil engineering, and academia. What Else Can I Expect From an Online Bachelor's in Public Administration Program? 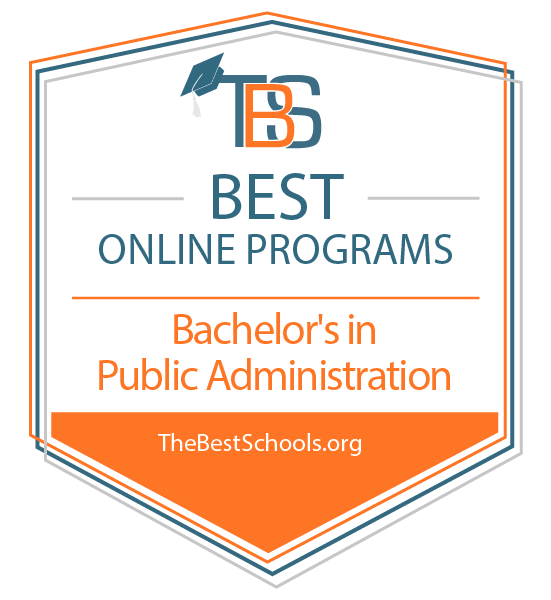 Online Bachelor's in Public Administration Degree Program Ranking Guidelines: We selected the degree programs based on the quality of program and range of courses provided, as well as school awards, rankings, and reputation. Based in Miami, Florida International University offers more than 40 online degrees, including a fully online bachelor's of public administration. The school's bachelor of arts in public administration prepares students to take on a variety of public policy and administration jobs. Although distance students complete coursework at their convenience, they still receive regular guidance from a personal success coach and live feedback from their instructors. Students also collaborate with peers on group work and projects. Students in the online program take 60 major credit hours and 60 general education credit hours. Core requirements for the major include public sector budgeting, policy development and implementation, and global city management. Students complete their studies with an integrative seminar in public administration in which they analyze a real-world public policy or problem within the field. Florida International University is regionally accredited by the Southern Association of Colleges and Schools Commission on Colleges. In addition to its main campus in Flagstaff, Arizona, Northern Arizona University offers more than 120 online and hybrid degrees. The school's online bachelor's in public administration allows students to earn their degree entirely online. Students can pursue a bachelor of applied science, bachelor of arts, or bachelor of interdisciplinary studies in this field, and each degree differs slightly in math, science, and humanities requirements. Whatever degree students pursue, they must complete 120 credit hours. Students can also pursue a minor in public administration, completing 18 credit hours of subject-related coursework. During their studies, students at NAU take required courses, such as ethics, policy, and administration; public policy formation and strategies; and organizational theory and application. They then choose additional major courses, such as managing change in 21st-century organizations and conflict resolution and mediation in the public sector. The program also offers an optional internship component, giving students the opportunity to gain hands-on experience in the field. Northern Arizona University is regionally accredited by the Higher Learning Commission. Troy University, based in Troy, Alabama, offers a unique political science program that allows students to pursue a concentration in either American politics and public administration or international politics. The school's online bachelor's with a concentration in American politics and public administration prepares students to work in government, law, nonprofit organizations, and business. It also prepares students to pursue graduate-level studies in areas such as public administration, law, and journalism. Students earning a public policy degree online typically complete the 120-hour program in four years. The major itself requires 36 hours of coursework. Required courses include world politics, political theory, and the art of political science research. Students choose a concentration course on one of the three government branches -- legislative, executive, or judicial -- and take three additional courses exploring subjects such as women in politics, southern politics, and African-American politics. Troy University is regionally accredited by the Southern Association of Colleges and Schools Commission on Colleges. Roger Williams University boasts a low teacher-to-student ratio and affordable tuition rates. In addition to its two campuses -- one oceanside campus in Bristol, Rhode Island and another in the state's capital city -- the school also offers a selection of online degrees through its School of Continuing Studies. The bachelor of science in public administration is one such degree. Students at RWU can also earn a minor in public administration. The online program requires a total of 120 credits, 27 of which involve required major courses while an additional nine involve elective courses related to public administration. Required courses include city management, public finance administration, and American government and politics. Students enjoy access to academic advisers and a support staff to help them navigate the path toward graduation. Students can also receive credits for life experience. Roger Williams University is regionally accredited by the New England Association of Schools and Colleges, Commission on Institutions of Higher Education. Despite its affiliation with the United Methodist Church, Central Methodist University welcomes students of all faiths and backgrounds. With its primary campus in Fayette, Missouri, the school boasts additional campus locations across the state. Students pursuing a bachelor's in public administration can do so on the school's partner campuses in Park Hills or Union, Missouri, or entirely online. Students at CMU can earn a bachelor of arts or a bachelor of science in public administration. Either way, the degree requires 120 hours of coursework split between general education and major coursework. Students complete 36 hours of courses related to public administration, exploring topics like the economics of public policy, group processes, and public policy analysis. They also take courses like urban and rural sociology and law in American society. Students may complete an internship or field experience requirement. All courses run for eight or 16 weeks. Central Methodist University is regionally accredited by the Higher Learning Commission. Based in Riverside, California, California Baptist University offers online degrees designed for working professionals. CBU Online features a year-round semester system that helps students graduate faster. The school also boasts a generous transfer system, honoring credits earned at community colleges or other accredited institutions. Because all CBU programs integrate Christian beliefs and views into the curriculum, the school's online public administration bachelor degree applies Christian perspectives to the study of public service. Upon completing the school's general education requirements, the bachelor of arts in public administration requires 48 units of coursework, which students typically complete in around 16 months. Required courses include administrative law and bureaucracy, contemporary issues in public administration, and executive leadership and management in the public sector. Students also take a career and professional development capstone course that helps them create a professional portfolio, apply to graduate programs, and assess long-term career interests. California Baptist University is regionally accredited by the Western Association of Schools and Colleges Senior College and University Commission. Unique among public administration programs, the University of Maryland - University College's online bachelor of science in public safety administration prepares students to take on leadership roles in organizations that manage corporate and homeland security emergencies. Students learn about emergency management systems and how to collaborate with other public agencies to ensure public safety, preparing for careers in homeland security, fire service administration, and emergency management. Outside of coursework, students can join the school's International Association of Emergency Managers chapter to learn about relevant jobs, certifications, and professional development opportunities. The school, based in Adelphi, Maryland, offers all of its major courses online and a few through a hybrid format. Required public safety administration courses explore subjects like contemporary public safety practices, public safety administration ethics, and decision making. In total, the degree requires 120 credits; students can transfer up to 90 credits from other accredited institutions. University of Maryland - University College is regionally accredited by the Middle States Commission on Higher Education. In addition to courses on its main campus in La Jolla, California, National University offers over 90 fully online degrees for working professionals. The school's online bachelor of public administration offers a unique opportunity for undergraduate students to transition into the school's master of public administration program while earning their bachelor's degree. Students within six courses of graduation may take two master's-level courses during their final semester of undergraduate studies to start their transition into the MPA program. Veteran-founded, the school offers discounted tuition rates to military personnel and their children. The bachelor's degree requires 180 quarter units. Students complete 12 required courses exploring topics such as public policy development, adaptive leadership in change, and government and nonprofit accounting. Students also complete a senior research project under the direction of a faculty member. National University is regionally accredited by the Western Association of Schools and Colleges Senior College and University Commission. Although Park University started at its flagship campus in Parkville, Missouri, it now offers classes on more than 40 satellite campuses and through its global online programs. The school offers a unique online public administration degree that boasts five concentration options: business relations, criminal justice, fire service management, homeland security, and public service. Students can also earn a minor in public administration. Because the program serves a high percentage of veteran students, many of the courses feature a blended format to fulfill VA guidelines that require 60% face-to-face instruction. Whatever concentration students pursue, the degree requires 45 hours of public administration coursework. Mandatory classes explore subjects like state and local government, capitalism and societal issues, and administrative law. For their concentration, students take specialized courses like small business management, criminal justice and the community, emergency management, geography of terrorism, and comparative political systems. All concentrations require a senior project. Park University is regionally accredited by the Higher Learning Commission. Columbia College, a nonprofit school that boasts affordable and honest tuition rates, offers nearly a dozen online programs. Students can earn their bachelor of arts in public administration through the school's online college or in-person at its campus in Columbia, Missouri. The school also offers a bachelor of science in public administration through a face-to-face program on its Columbia campus. Students earning an online public administration degree take courses such as methods of public decision making, American public policy, and public human resource administration. Students also complete an internship at a local government office or nonprofit organization, logging 45 hours of work per enrolled credit hour (typically three credit hours for BA candidates). Before graduating, students take a senior seminar in political science and public administration in which they create a research project and write a final paper. Columbia College is regionally accredited from the Higher Learning Commission. Based in La Verne, California, the University of La Verne boasts several campuses across California. It also offers a selection of undergraduate and graduate degrees fully online. Only students in select authorized states may enroll in La Verne's online programs; students can check a La Verne's list of authorized states to see whether their state qualifies. The school offers an accelerated bachelor of science in public administration online and on its campuses in Irvine, Bakersfield, Ontario, Victorville, Rio Hondo Community College, and Vandenberg Air Force Base. The PA major requires a minimum of 40 semester hours of coursework, including 28 semester hours of core requirements and 12 semester hours of electives. Core requirements include classes like management of change and conflict, policy-making process, and urban studies. Electives explore topics like business ethics, written business communication, and local government management. All students complete a senior project. University of La Verne is regionally accredited by the Senior College Commission of the Western Association of Schools and Colleges. Based in Pittsburgh, Pennsylvania, Point Park University offers a wide selection of online undergraduate, graduate, and certificate programs. The school's online bachelor of science in public administration offers concentrations in EMS administration and fire service, preparing students to compete for public policy jobs relating to emergency and fire services. Students typically earn their bachelor of science in two-four years, depending on the number of transfer credits and their per-semester course load. Overall, the degree requires 120 credit hours of coursework, 15 of which come from major courses and 21 of which come from concentration courses. Required major coursework includes principles of management, public budgeting and finance, and policy and decision analysis. Students in the EMS concentration explore topics like EMS community risk reduction and legal, political, and regulatory issues in EMS. Students in the fire services concentration take classes about the applications of fire research and fire prevention organization and management. Point Park University is regionally accredited by the Middle States Commission on Higher Education. Based in Columbus, Ohio, Franklin University targets working students, thus students' average age is 34. The school offers many fully online degrees, including a bachelor of science in public administration. Unique among other programs of its kind, the BS in public administration at Franklin focuses intently on the leadership aspect of public service. Overall, students complete 120 credit hours of coursework, 30 of which they must complete at Franklin. Required major and professional courses cover subjects like management information systems, government and nonprofit budgeting, and organizational communication. Students also complete a capstone requirement. Students may concentrate in one of three elective pathways: criminal justice, pre-law, or recreation and sports management. In each pathway respectively, students take courses like criminal justice management and administration, courts and criminal procedure, and managing athletic programs. Franklin University is regionally accredited by the Higher Learning Commission. Located on the tropical island of Oahu, University of Hawaii - West Oahu's distance learning program serves students who either completed their first two years of college at the school's Oahu campus or at a community college on a neighboring island in the state. In other words, only students who physically live in Hawaii may take the school's online courses. Students with two years of qualifying coursework can transfer into one of the school's many popular online degrees, including an online bachelor of arts in public administration. Students earning their BA in public administration can pursue a concentration in disaster preparedness and emergency management, justice administration, general public administration, community health, or healthcare administration. Students can also earn a certificate in healthcare administration or disaster preparedness and emergency management. All students complete either a practicum experience or a senior project. University of Hawaii - West Oahu is regionally accredited by the WASC Senior College and University Commission. Upper Iowa University offers a public administration degree either fully online or through a blended format that combines online and face-to-face courses on the school's campus in Fayette, Iowa. Distance students can pursue a self-paced degree in which they progress through their studies at their convenience. In addition to earning a general public administration degree, students at UIU can pursue an emphasis in emergency management or fire science, law enforcement, or policy/politics. The degree requires 21 credits of general education and core courses and around 24 additional credits of coursework within the chosen emphasis. Required courses for all students in the major include U.S. government, cases in public administration, and a senior project. Emphasis courses explore specialized topics such as emergency preparedness and planning, substance abuse, and administrative law. Upper Iowa University is regionally accredited by the Higher Learning Commission. Located in Clearwater, Florida, St. Petersburg College offers a fully online bachelor of applied science in public safety administration. The school offers credit for previous academic training and professional experiences, helping students earn their degree faster. Students pursuing a bachelor's in public safety administration can pursue one of four sub-plans: criminal justice, emergency management and homeland security, fire science, and cross-discipline, which involves a combination of sub-plans. To receive admission to the program, students must possess at least 60 college-level credits in a field related to public safety. Students without a relevant associate degree must complete a minimum of 24 credits of lower-level public safety courses in addition to the bachelor's requirements. The program demands 27 credits of core requirements, six credits of electives, and nine credits of sub-plan courses. Sample required courses include managing conflict in public organizations, administrative law, and program planning and evaluation. All online courses last eight weeks. St. Petersburg College is regionally accredited by the Southern Association of Colleges and Schools Commission on Colleges. Indian River State College in Fort Pierce, Florida offers 12 fully online degrees through its virtual campus, including a bachelor of science in public administration. The program targets students with an associate degree in fire science, criminal justice, emergency administration and management, emergency medical services, public administration, or paralegal studies. Students with a degree in a different subject may still apply; the school reviews these applicants on a case-to-case basis. Students pursuing a public administration degree online choose one of two concentrations: emergency planning and management or public policy and leadership. Both concentrations require 60 credit hours of coursework. The emergency planning curriculum includes courses in multi-agency incident command, emergency services public policy, and foundations of public safety. The public policy and leadership track boasts classes in urban and regional planning, policy development and implementation, and administrative law for public administrators. Both concentrations require a senior capstone project. Indian River State College is regionally accredited by the Southern Association of Colleges and Schools Commission on Colleges. The University of Maine at Augusta's online bachelor of science in public administration serves students with either an associate degree in a related field or with a bachelor's degree in an unrelated field. Students without any college credits must first earn general education courses at one of the school's campus sites or at another accredited school before receiving admission. Students with a relevant associate degree must complete 60 credit hours of coursework to earn their bachelor's. Qualifying associate degrees including those related to healthcare; criminal justice, paralegal, or justice studies; social or human services; fire science; and computer technology. Those with a bachelor's degree in a field unrelated to public administration must complete 30 credit hours of coursework to earn a post-baccalaureate degree in public administration. Distance students can complete assignments on their own time through a delayed format or they can participate in live class sessions through the school's interactive TV site. University of Maine at Augusta is regionally accredited by the Commission on Institutions of Higher Education of the New England Association of Schools and Colleges, Inc. The fully online bachelor of public administration at Barry University helps professionals in public service and nonprofit sectors pursue public management jobs. In addition to the online option, students can take courses on the school's Miami campus. To accommodate working professionals, face-to-face classes take place on weeknights or Saturdays. All courses last eight weeks. The program requires 45 major credits: 30 credits of major courses and 15 credits of electives. As not all electives follow a digital format, students should make sure the school offers their preferred electives online. Required major courses include productivity improvements in the public sector, human resources in the public sector, and a capstone project. Students can earn up to 30 credits for previous academic training or professional experiences. Barry University is regionally accredited by the Southern Association of Colleges and Schools Commission on Colleges. Many schools offer online public administration degrees. While these programs often share similar curricula, be sure to select a program that offers coursework aligned with your personal interests and professional goals. In the first and second year, you should expect to take general education classes in subjects like communication, math, history, and humanities. You may also take foundational courses in public administration, allowing you to explore topics such as organizational behavior, the principles of management, state and local government, and policy analysis. As you advance through a four-year program, you can choose from diverse elective classes. You may take courses in nonprofit management to prepare for a career leading a community organization. You may also take a class in administrative law, which will help you determine if you should apply to law school after graduation. Other students may focus on electives in budgeting and auditing to take on roles in public financial management. Regardless of your area of interest, earning a public policy degree online often requires completing a capstone project. This project, usually offered in your final year, allows you the opportunity to apply classroom learning to a real-world challenge in the public sector. Some programs offer formal concentrations in areas like nonprofit management, business, and public policy. Choosing a concentration gives you a competitive edge when applying for jobs or master's programs in your specialization. Students concentrating in nonprofit management often seek careers working for community organizations, charter schools, or quasi-governmental agencies. They usually take coursework in subjects like fundraising and resource development, program design and analysis, and human resources. A bachelor's degree and relevant experience often qualify candidates for management and leadership roles in the nonprofit sector. Many businesses work in close collaboration with public agencies. Students specializing in this area receive training applicable to both the public and private sectors. For example, a graduate may take on a position at a construction company that primarily works with government clients. Students study topics like accounting, communication, and project management. Rather than focusing solely on administration, students in this concentration examine the role of public policy in shaping access to government services. This concentration often involves multiple courses in statistical analysis, along with specialized classes in areas like healthcare, criminal justice, and financial policy. Students may also explore local, state, and federal laws applicable to these areas of policy work. In this class, students receive a broad introduction to the structure and function of the U.S. political system, from municipalities to the federal government. The course also covers the role of nongovernmental actors like the media and special interest groups. This course offers an overview of the major, giving students the opportunity to learn how various social, economic, and political forces shape public administration. It also introduces students to potential careers in the field. Whether employed at a nonprofit organization or government agency, you should know how to secure public funds to support your work. This course introduces students to the fundamentals of the public budgeting process. Students in this course learn how the public influences policy and how the mechanisms of that influence evolve over time. They also explore practical techniques for engaging with members of the public during the policy development process. Evaluation and measurement play critical roles in public administration. In this course, students learn how to properly set goals and use data to measure progress. They also explore methods of disseminating the results of these evaluations to relevant stakeholders. With a bachelor's degree in public administration, you can pursue a variety of public policy and administration jobs. You may work for a nonprofit organization or pursue entry-level positions in local, state, or federal governments. Many students also use their bachelor's as a springboard to a master's degree in public administration, qualifying them for more advanced roles in the field. Social and community service managers oversee social programs and lead nonprofit organizations. They must work with community members to identify challenges and opportunities, find sources of funding for programs and services, hire and train staff, and advocate for policy matters. These managers typically need at least a bachelor's degree. Administrative services managers direct the support services of their organization, including government agencies and policy think tanks. This may involve supervising other administrative personnel, creating and maintaining database and information management systems, and ensuring that facilities comply with government regulations. These positions typically require a bachelor's. Urban and regional planners create plans and programs to use land in ways that benefit local residents, drive economic growth, and protect the environment. Public policy jobs like this often require a master's in planning, for which a bachelor's in public administration provides preparation.